Dale has served as public address announcer, high school official, news reporter and activist in youth sports for more than 30 years. 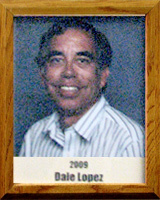 Dale was the PA announcer for the Tucson Toros/Sidewinders from 1984-2008, while also working PA in Amphitheater High football, Pima College basketball, Tucson High basketball, UA women’s basketball, UA baseball and various track and field events. He has officiated high school basketball and softball games, worked as sports director at KTUC radio (1985-89) and overseen the after-school recreation program at Roskruge Elementary and Middle Schools since 1974. He also has been boy’s basketball coach at Roskruge since 1996 (124-39) and has directed Tucson city basketball, softball and cross country events since 1983. His Roskruge basketball team won the TUSD championship for the 2005-06 season, and has won seven division titles in his tenure.